Original Celtic-styled songs driven by eight musicians delivering sweet harmonies, traditional sensibilities, and steeped in a reverence for both ancient and contemporary styles. Ha’penny Bridge is a Northern California Celtic music band comprised of seven musicians from the Chico, California area. Its dynamic, vocal-driven sound has been aptly described as “California Celtic” due to the band’s unique repertoire of Mark McKinnon’s original songs, its stirring adaptations of classic and contemporary Celtic-style ballads, and creative infusion of traditional Irish and Scottish tunes. Although Ha’penny Bridge is a relatively new addition to the Northern California Celtic music community, it is made up of musicians with a rich, cumulative pedigree in Celtic and corollary musical genres. Its rapid rise as one of Northern California’s most popular Celtic bands has garnered a large and enthusiastic following of music lovers of all ages drawn to the group’s powerful, ensemble-style playing and ringing vocal harmonies. Its lineup features the vocals of Molly McNally and Mark McKinnon (also on guitar), as well as Jewel Cardinet on mandolin, Vita Segalla and Rebekah Snow on fiddles, Tom Haber on bass, and Dharma LaRocca on congas. 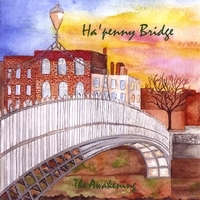 Ha’penny Bridge released its first studio CD album of original songs, "The Awakening," September, 2008, just prior to its very successful debut at the prestigious KVMR Celtic Festival in Grass Valley, California. The band is grateful for the wonderful reaction to the CD, which includes steady airplay on Chico's KZFR. Ha'penny Bridge is currently adding new material to its already extensive repertoire, as well as developing several new original songs to be included in its next CD. The band plays a versatile range of songs and tunes perfect for pub and club venues, as well as for weddings and other festive gatherings. Contact Mark Mckinnon at mcksnake@yahoo.com/530-877-0152, or Molly McNally at millymcnilly@yahoo for bookings and more information.